Ever wanted to stay the night in a yurt, overlooking the ocean? How about a rustic cabin in the mountains, a tree house in the woods, or even a fire lookout with sweeping views? 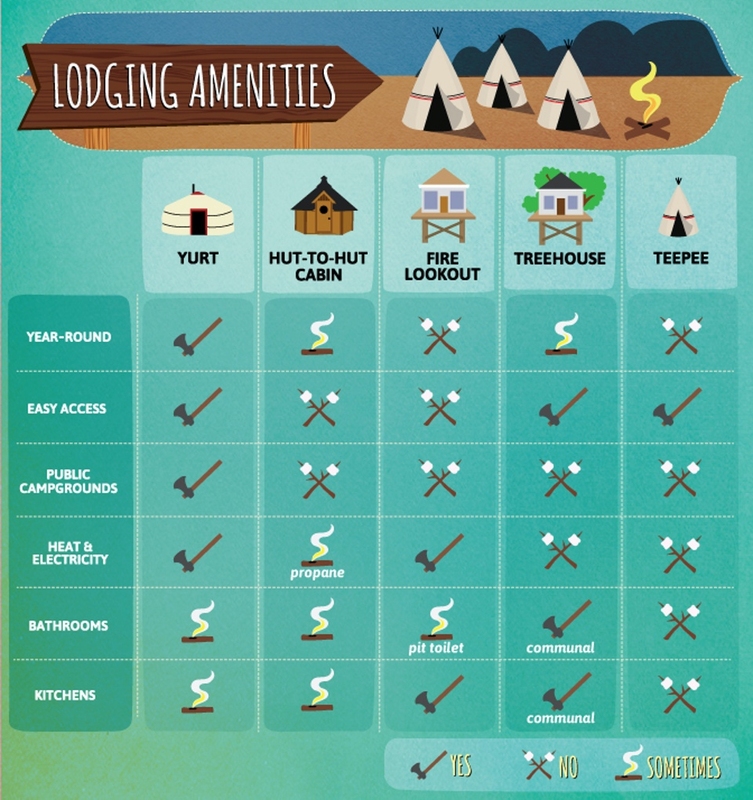 All of the above are easily accessible to all travelers – no wilderness experience necessary! Extend the camping season with these year-round outdoor lodging experiences, and learn where and when to book them. Yurts are not just in rural Mongolia anymore! These canvas-sided circular shelters have been popular additions to many state parks across the U.S. and Canada, offering four-season lodging for those without an RV or camper. Perfect for familieswith young children, yurts come in rustic or deluxe models, all with electricity, beds (bring your own bedding), and heat. Arriving late to the campground? No need to hassle with tent setup! Want to experience the outdoors without sleeping on the ground? Yurts are the perfect solution. Channel your inner Little House on the Prairie when sleeping in cabins in private campgrounds like KOA Kampgrounds or state parks and reserves. Like yurts, cabins range from simple shelters to “glamping-style” cottages with one to three rooms. Some, such as select KOA cabins, offer full bathrooms and kitchens in their deluxe models. State park cabins typically offer a room, beds, and a porch or balcony, plus a fire pit and picnic table for cooking and dining. 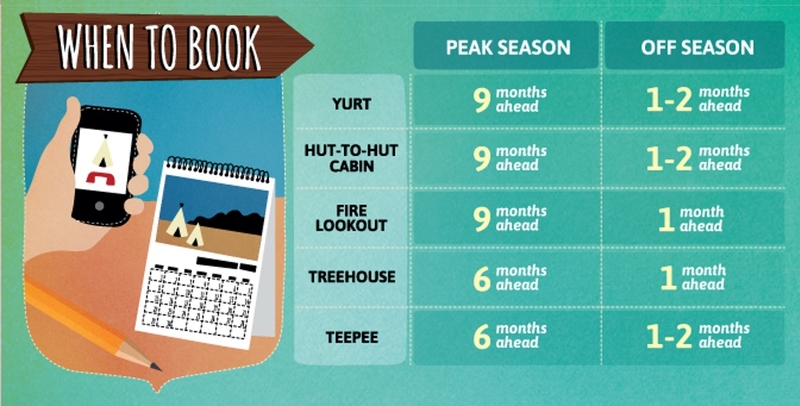 Campers wanting to get further afield can opt for a hut-to-hut hiking experience. Run by private companies on both coasts, hut-to-hut operations allow backpackers to hike anywhere between three and ten miles to various backcountry huts. Depending on the operation, huts can include hot meals, full bedding, or simple shelter. Want a room with a view? Operational and retired fire tower lookouts across the country now offer public access for nightly stays, and they’re easier to book than most travelers think. Run by Recreation.gov (the same folks who book many traditional campsites), fire lookouts are usually one-room affairs, with heat and electricity and a simple kitchen. Most are accessible via car by primitive road, though some require a hike in. Without exception, fire lookouts afford amazing wilderness views (without the firefighting job). The kids will thank you for a Tarzan camping trip! Tree house resorts, or “treesorts”, have sprung up in several rural locations across the U.S., offering nightly stays in inventive lofts, cabins, and tents in the air. Tree houses range from basic to deluxe, with group kitchens and bathrooms located on the ground. The best treesorts include rope bridges spanning trees and plenty of swings. Many have age restrictions to ensure child safety, so families will want to make sure all their little monkeys make the cut. Read more about, “5 Unusual Outdoor Lodging Picks” from our friends at FIX.com here.